Guillerme et Chambron single armchair Signature perused oak, floating armed frame and spindle back. Reupholstered in burnt orange linen. Nightstands in oak by Guillerme et Chambron. Oak vanity table with blue top By Guillerme et Chambron France, 1950s Table is intended to hold a curved piece of mirror. A pair of nightstand by Guillerme et Chambron in oak and ceramic top. 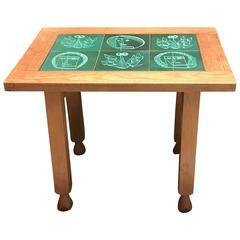 Mid-Century oak woodwork table with ceramic tiles by Boleslaw Danikowski. Two-tier oak side table by Guillerme et Chambron with glass shelves. Dessert table with ceramic tiles by French midcentury designers Robert Guillerme and Jacques Chambron. 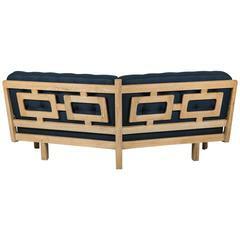 Coffee table with ceramic tiles by French midcentury designers Robert Guillerme and Jacques Chambron. 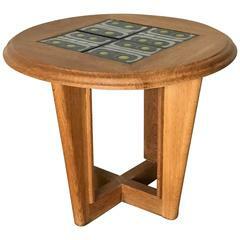 Votre Maison small table oak and ceramic.